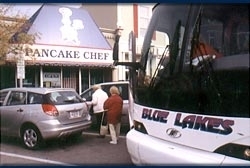 The first thing you should know about the Pancake Chef is that we are a full service restaurant and offer a complete Breakfast, Lunch and Dinner menu. However large groups are best served with our Breakfast or Dinner Buffets which are second to none. The buffet also allows us to handle groups in a friendly, efficient fashion without compromising our reputation for excellence. We seat 170 Guests, are barrier free and are located just 250 feet from ferryboats to Mackinac Island. Buses can offload your Guests ar our front door and park conveniently nearby. We have 20 years experience serving group tours and have an understanding of your needs and those of your Guests. Accordingly, we prefer an opportunity to board the coach prior to it's unloading to welcome your Guests and make them aware of our ability to accommodate any special needs. Please review our group tour menu, which will give you a sense of our buffet offerings. Should you have any questions, please call us directly at the group tour toll free number 1-888-436-5578 or Contact Us via email.